When it comes to climate patterns, nobody can truly foresee the damage that severe weather and natural disasters can inflict – especially when it comes to importing and exporting goods. Thankfully, there are a number of steps you can follow to help your business prepare for the worst, or better yet, plan for how to proceed during an emergency weather situation. In layman’s terms, this means any devastating incident that disrupts everyday operation in any given area that cannot be resolved with local resources alone. These disasters can occur due to a number of reasons, including geographical, meteorological, climatic, biological, hydrological, or even space-related. In most cases, a severe weather occurrence or a natural disaster will include disasters from numerous categories, such as a hurricane with severe flooding or heat waves with tornados. In any case, it is important to have systems in place that can be activated in case of one of these events. 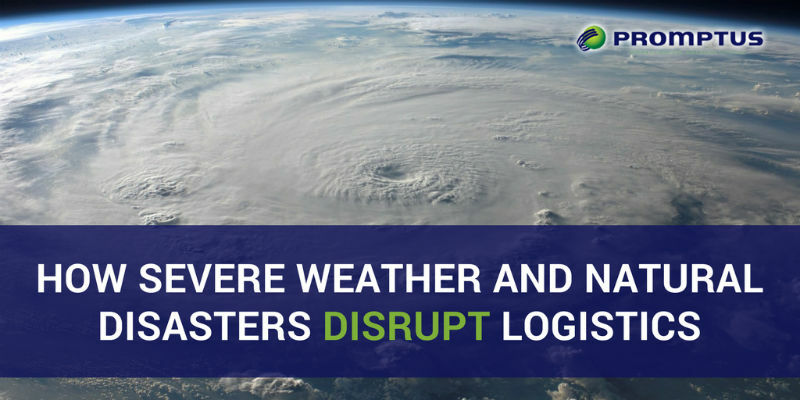 Severe weather has been known to affect logistics, as well, with global supply chain management disruptions rising 29% since 2012. According to the 2017 Global Risks Report, extreme weather is considered a top risk. This may also be due in part to companies’ failure to properly prepare for the threat associated with severe weather warnings. TheStreet reports trucking companies in the United States lose an estimated $2.2 to $3.5 million annually because of weather delays. That’s a lot of money! So what can you do to help your business be protected and prepared when severe weather or a natural disaster strikes? Discuss a plan of action. While there is very little you can do to sway the weather, you can take steps to ensure your import or export business doesn’t suffer too greatly from delays or damage. Take the time to develop a course of action that you and your employees should refer to in the event of a disaster or severe weather conditions. This arrangement is typically known as a disaster risk management plan. Here are some tips when creating your risk management plan that can help to minimize disruptions in your services. Assess the Risk. While it is impossible to always plan for weather accurately, you can absolutely do your part to stay on top of potential impacts, like tornado, hurricane, or flood warnings by your local meteorologists. Determine where the risk is coming and what part of your logistics will be affected. Be aware of various threats and risks and have multiple ways to move forward in lieu of them. Prepare in Advance. You should never wait until a disaster strikes to attempt to collect the supplies or materials you need. Instead, accumulate extra fuel, parts, equipment, and any necessary items ahead of time. You can always make additional preparations in light of any potential risks. For example, having copies of any important data either in the cloud or stored at an off-site location can help in the event of physical damage to your location. Discuss a Plan of Action. The mitigation process will essentially decide how your company reacts to a natural disaster or unexpected weather. How will you communicate with employees if cell towers are down? How will you notify your customers of potential delays or complications? Will your supplier or your shipments be affected? Ask yourself questions that you may have to consider in a disaster situation so your operations don’t suffer. Response and Recovery. Once the situation has been resolved or the disaster has been addressed, you will need to go into a recovery response mode. This means repairing any issues or services that have been impaired, doing any necessary damage control, and trying to maintain as many operational systems as possible. This process may involve repairs, especially if you have been personally affected by dangerous weather conditions. Consider the most cost-effective way to get your company up and running at its full capacity again as quickly and efficiently as possible. At Promptus LLC, we are a multi-industry logistics company that works with a number of importers and exporters all over the globe. This requires us to stay on top of weather patterns in various areas throughout the world and to have multiple disaster management plans in place in the event that weather catastrophe occurs unexpectedly. For the 15 years we have been in service, we have made it a point to employ the most advanced technology available to maximize efficiency for both our clients and us. Our headquarters are located in Miramar, FL, an area prone to hurricanes, so we are well experienced and wholly prepared to withstand powerful nature storms and weather disasters. We have plans of action in place to help minimize the risk of damage during weather emergencies. Call us today to get your free freight forwarding quote!